Timmie Morrow only had one hit in the game, but he made it count. 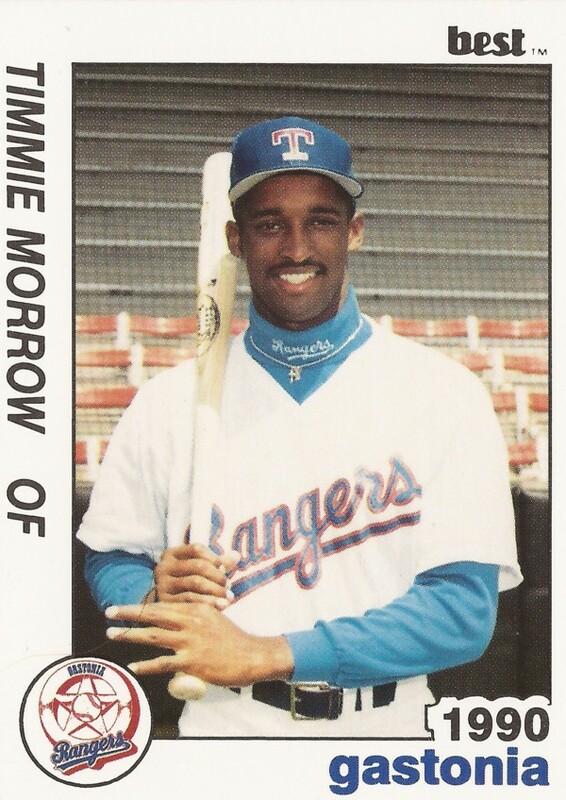 In the bottom of the ninth, the score tied and two on, Morrow knocked home the game winner for the Charlotte Rangers this day, June 19, 1992. The hit was one of 89 Morrow got for the high-A Rangers affiliate that year, but those hits amounted to a batting average on the year of just .232. It was Morrow's fifth season in professional ball, but his progress had been slow, as evidenced by his continued presence in high-A. Morrow would make AA Tulsa for seven games that year and AAA Oklahoma City for seven games in 1993, but Morrow would never make Texas. 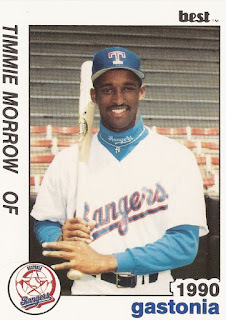 Morrow joined the Rangers system in 1988, taken by Texas in the second round of the draft out of South Alamance High in North Carolina. Morrow began with the rookie Gulf Coast League Rangers, hitting .248 and two home runs. He returned to rookie ball in 1989 with the Pioneer League's Butte team, hitting .271. At single-A Gastonia in 1990, Morrow's home run total increased to seven, but his batting average dropped to .206. Then it was high-A Charlotte for two seasons. With Charlotte in 1991, Morrow showed some speed. In 119 games, he stole 33 bases. Four of those swipes came in the same game, on Aug. 14, 1991. On May 29, 1992, Morrow's double helped Charlotte to a 4-0 first-inning lead. "I like those big first innings," manager Bump Wills told the Sarasota Herald-Tribune. Morrow largely spent 1993 and 1994 at AA Tulsa. In 1994, Morrow won a pre-game home run hitting contest. But in-game, Morrow struggled. He hit .246 his first year, and just .204 his second. During the two years, Morrow got a 12-game look at AAA Oklahoma City, hitting .189. His final year with the Rangers system was 1994. Two more seasons in independent ball, with the Bangor Blue Ox of the Northeast League and he was done.